Every child loves birthday cake! Why not have a giant birthday cake moonwalk for them to jump around in? Pure sweetness! 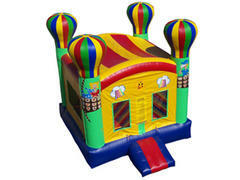 This awesome fun house is perfect for both boys and girls. 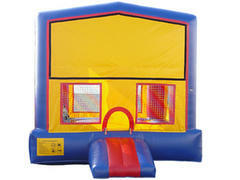 At 15 x 15, it's the largest standard bounce house, and comes with a basketball hoop inside. Vroom!!! Kids will have a speedy time in this Cars Moonwalk. Dora, Dora, Dora The Explorer!!! Keep your little explorer bouncing and occupied in this fun themed moonwalk. Barnacles!!! This Spongebob Square Pants moonwalk is enjoyable by kids of all ages and versatile for both boys and girls. Straw-ba-ba-ba-ba-berry Shortcake! 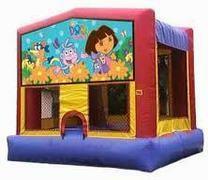 Every girl will have a sweet time on this sweet bounce house! 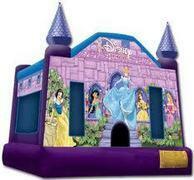 It's a perfect party rental for themed birthday parties and much more! This blue moonwalk is perfect for parties of all sizes. 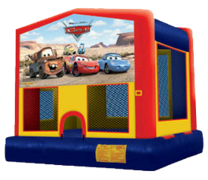 Whether you're planning a birthday party or a church or school function, kids always love jumping in this large bounce house! Who will be king of this castle? 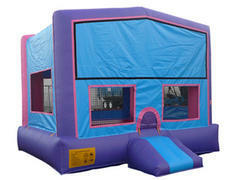 With so much fun to be had, all children will feel like royalty in this awesome moonwalk! It even has a basketball hoop inside! Basketball NOT included. Up, up, and away! 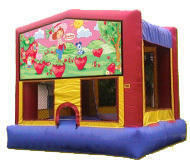 This balloon bounce house is perfect for children wanting to get some serious air time! It also comes with a Basketball inside! Basketball NOT included. 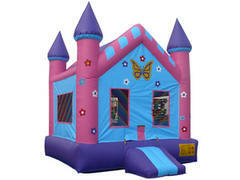 Have a "Royal"celebration with our Princess castle. This officially licensed Disney Princess Castle is sure to make every girl feel like a princess! Our sports moonwalk is perfect for sports enthusiasts everywhere. 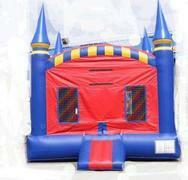 It's the perfect party rental for children who love sports, or anyone planning a party or festival that is sport-related!